Big and little Lac Courte Oreilles (LCO) are located near the top of the Couderay River Watershed in Sawyer Co. in northwestern Wisconsin. The name “Lac Courte Oreilles” comes from the French “Lake Short Ears.” Lake Short Ears was the name used by the first French traders who visited what was then known as Ottawa Lake. A local band of Ottawas observed the custom of cutting off a portion of their ears – hence the name. But others suggest the name came from the several ear-like shaped bays on the lake such as Musky and Stuckey bays. Big LCO covers 5,039 acre and is the 8th largest natural drainage lake in Wisconsin. It has a maximum depth of 95 ft, and averages around 35 ft. Some of the more prominent features are Musky Bay, then Stuckey Bay, the West, Central, and Eastern Basins. About a third of big LCO and all of little LCO are on the 69,000 ac reservation of the Lac Courte Oreilles Band of the Lake Superior Chippewa. Big LCO is a very special and sensitive lake. It is classified as an oligotrophic, Outstanding Resource Water. Of Wisconsin’s 15,000 lakes and impoundments, fewer that 1% are designated as Outstanding Resource Waters. This designation is intended to meet federal Clean Water Act obligations requiring Wisconsin to adopt an “antidegradation” policy that is designed to prevent any lowering of water quality – especially in those waters having significant ecological or cultural value. Outstanding Resource Waters are current protected by a specific Wisconsin antidegradation rule (WAC NR 207.03(3)). 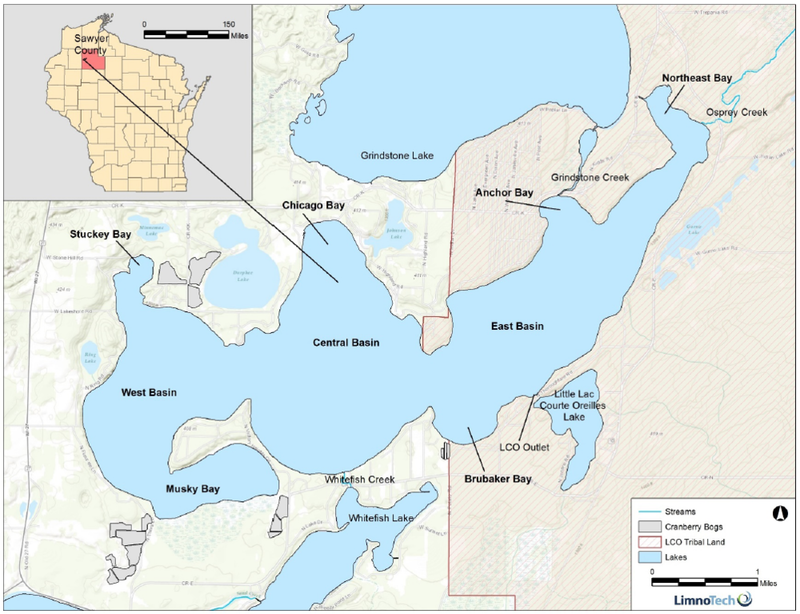 Big LCO is a deep stratified, two-story cold-water fishery - one of only five such lakes in Wisconsin with self-sustaining populations of both whitefish and cisco. The State’s most protective total phosphorus criterion, 15μg/L (NR 102.06), has been applied by WDNR to LCO. There are ten lakes that comprise the Upper Couderay River watershed. Big and Little LCO are at the base of the drainage, and the outlet from Little Courte Oreilles leads into the Couderay River. The Couderay then joins the Chippewa River, which eventually flows through Eau Claire and into the Mississippi right below Pepin, Wisconsin. The watershed covers 68,990 ac of which 61% is forested, 12% is agricultural, 9% is developed, 5% is grassland/pasture/shrubland, and the remainder is open water or wetlands.